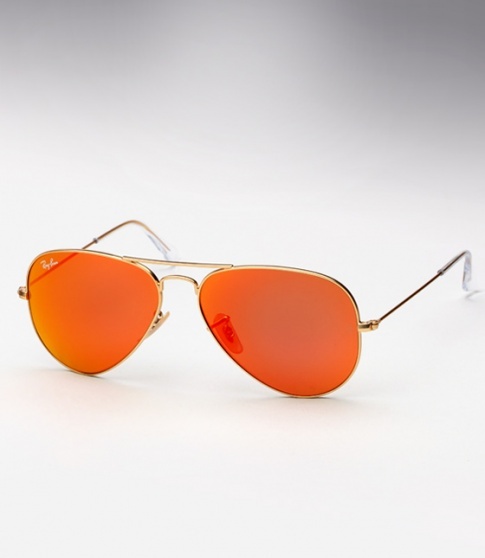 Ray Ban Aviator RB 3025 - Colored Mirror (Sunset) Need Help? The Ray Ban RB 3025 Aviator sunglasses is the shape that started it all; the brand staple originally designed for the U.S. military fighter pilots in 1937. Ray-Ban Aviator sunglasses have a timeless universally face flattering look with its unmistakable teardrop shaped lenses. The iconic Ray Ban Aviator RB 3025 sunglasses gets a splash of color in the form of full-on colored mirrored lenses. Mirrored lenses reduce glare while retaining contrast, perfect for driving, days on the ocean, or to simply block those envious on-lookers. Also worth noting, the mirrored lenses give off slightly different hues depending the angle the light catches it, for example the orange becomes orange/yellow/ red.